Medieval scribes, given half a chance, made it clear where the divisions of a text were. 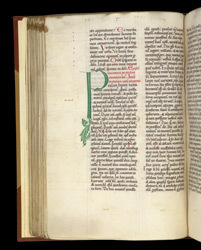 The red writing (rubric) tells the reader that the first part of the commentary on Psalm 30 (31) has ended and the second begins. The commentary itself begins with the large green letter. The squiggles in the margin above it are citation marks, indicating the text of the psalm is being cited in the adjacent column. The note 'sculcatum' in the left margin refers to a difficult word in the text ('exsculptum'). The 'nota totu[m]' in the lower margin is a warning to read carefully.